Or ask [moira hawthorne] or myself [LynnAnneBrown] to help you. My Apologies for the simplicity of this map, but as I have discovered Map Making takes a lot of skill and I'm still learning. But none the less, it should give you a basic idea of the lay of the land. Covensteads holdings are the areas marked in darker green and extend a little to the east and west of what is shown on the map. To the North, in the area marked in lighter green is ElfTown Proper. And to the south is the "Lake of Dreams"
The road that marks the the top border of Covenstead is named "Ramblers Way" and leads to ElfTown in the east and unknown adventures in the west. The streams that surround the center area of Covenstead have yet to be named. 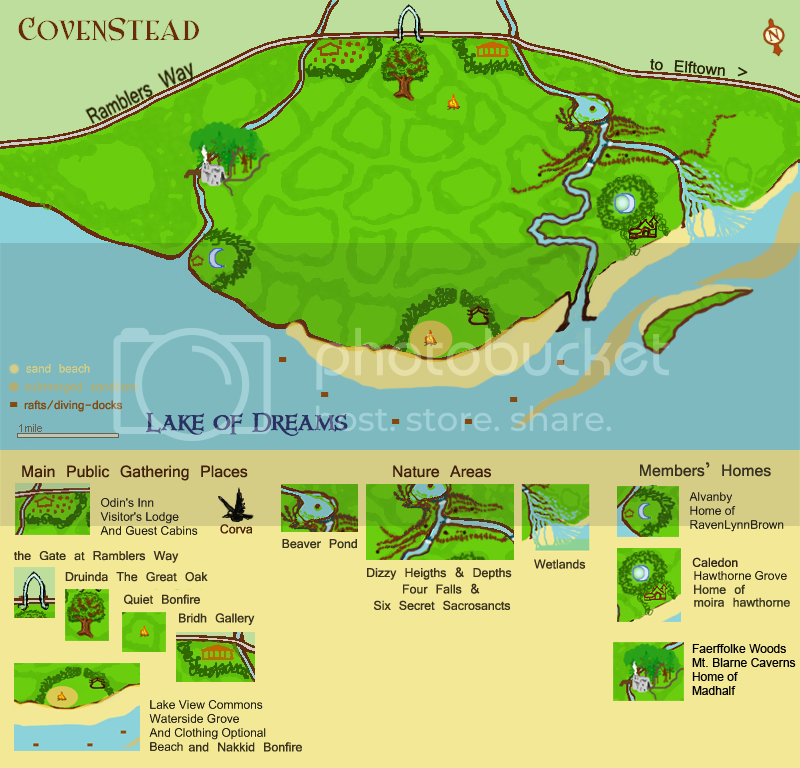 The main area of Building will be in the center area of Covenstead, between the lake and the road to the north and south and the two streams to the east and west. The lands to east and west will be left wild except for the natural footpaths that I am sure will be worn by those who enjoy more primitive environments. 2009-02-25 [LynnAnneBrown]: I have idea, moira, because I know you have some wonderful ideas for the map but have been only waiting on wicked putting her piece in. But what I was thinking would be good is if you were to pick out a nice spot for her, make it a good size hunk, like the little island you have made for yourself, and see if she likes it when she can get to it. And when she gets here she can claim that spot or if another spot is open that she would prefer then just open up the spot we have been holding onto for others to claim, what think you. And by the way that little Island that you have carved out for yourself is lovely. I think it would be fair to consider that all a part of Caledon. I think that it is fair that each of the founding households, Yours, mine and Wickeds be given a little place that we get to turn into our own little world within a world. What think you. Although I am not looking to carve out any a larger piece for me since I already have covenstead as my playground. The cottage, the lake and stream, and the tree's behind are enough for me when I have all of Covenstead to explore and play in. 2009-02-25 [LynnAnneBrown]: That sounds absolutely amazing. And the ferry docks are great. People need more that one way of getting in and out, I like that. And Although I came up with Lake View Commons for the Nikkid beach it was mostly because I couldn't come up with anything else at the time. 2009-02-25 [LynnAnneBrown]: And all with hash browns on the side. 2009-02-26 [LynnAnneBrown]: and other items that might be useful to happy nikkid people playing around on the beach......Volley balls, Nets, Badminton Raquets and birds.......condoms.......soft drinks.....Druinda, has assured me that her friends will make sure folk can get a bit of privacy when they want it. So I'm sure the Blind around the Beach will enjoy a lot of activity. 2009-02-26 [Araglas]: ooohh!! I found the perfect spot for the hunting lodge!! On the otherside of the river of LadyRavenLynns lovely home! 2009-03-10 [Araglas]: awesome! ^^ thankies!! !